Exactly one month before my son was born, I was informed I would become a part of a mass layoff due to company downsizing. I would not have a job to return to after my maternity leave. Being a stay at home mom had always been a dream of mine. However due to economic times, this was not something feasible for my family and I. Wanting to maximize my time with my family while also being able to financially support my family, I was determined to find a way to do both. I decided I WANNA GLO! I started my own business and became a Custom Spray Tan Specialist along with my twin sister and sister in law. It is fun to hear people say "I WANNA GLO", but most importantly I'm offering something safe and all natural, not to mention something that helps boost our self confidence by embracing our inner GLO. I've personally spray tanned clients with skin challenges and whose skin does not tan. I was able to hide their challenges and provide them with a gorgeous GLO in just one spray tan application. Ultimately this business is more than just business to me. It touches close to home. My grandmother has been diagnosed with melanoma skin cancer. She's had surgery several times and it continues to come back. She lives every day with scars on her face from all the surgeries. My stepdad got a severe sunburn over 20 years ago that resulted in photodermatitis. He now has significant irreversible damage to his skin. By offering Custom Spray Tans I can now help people not only look and feel their best, but prevent them from going through what my family members have gone through. Whether YOU WANNA GLO for health reasons or just to be tan, this is the solution for you! I WANNA GLO is a family owned and operated Custom Spray Tan business that is unique because we can come to you or you can come to the salon. We will bring your GLO to you in the comfort of your own home! With our portable tanning tent, that means no mess to your home or business. 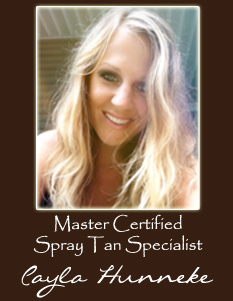 Our Custom Spray Tan Specialists are Master Certified, skilled, and experienced. You can rest assured that you are receiving the best tan from a trained certified professional. The solution is skillfully applied in a private tanning tent which takes about 10 minutes or less. You will experience an immediate and natural looking "just walked off the beach" GLO. You can expect your GLO to last 7-10 days. With follow-up applications and our all natural tan extender products, you can maintain your tan indefinitely. • Once the tan is set, the formula will not rub off on clothing or wash off in the pool. • Your spray tan will fade gradually and evenly, just like a "real" suntan. • A Custom Spray Tan is completely safe and is FDA approved. • Spray tanning by I WANNA GLO gives a natural, golden-brown color. There is NO orange discoloration. • Please note: Spray tanning solution does not contain UV protection. Always wear sunscreen. At I WANNA GLO, we want you to look and feel your best but our number one focus is your health. Spray tanning is a safe way of achieving a golden GLO without the risks of skin cancer often associated with overexposure from the sun or from a tanning bed. An added bonus to receiving a Custom Spray Tan by I WANNA GLO is you will instantly notice your skin's imperfections fade away right before your eyes. Say goodbye to stretch marks, spider veins, acne, and more! The solution we use during your Custom Spray Tan does wonders to the look of the skin and gives an airbrushed affect. Unlike most tanning solutions, ours does not leave a sticky feeling on the skin. This is a significant detail which you will be very happy to feel. With I WANNA GLO, you will have a tan that dries fast and clean, without that sticky feeling. 1. It dries with super lightning speed! 2. It is not sticky what so ever. 3. It is super nourishing to the skin! 5. There was minimal odor, the least odor of any I have tried. 6. The color is so dark and natural.